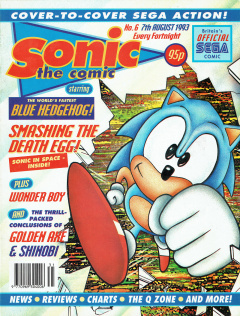 Sonic the Comic 6 is the sixth issue of the Sonic the Comic series by Fleetway. The non-comic 'zones' of this issue were the Control Zone (Introductions and Staff Details), Review Zone (Games across all current SEGA platforms reviewed on a % scale), News Zone (Information on upcoming SEGA events and products), Graphics Zone (Reader-submitted artwork), Q Zone (Cheats, Game Genie codes and strategies for popular or requested games) and Speedlines (Reader letters, with replies from Megadroid, the comic's mascot character). As always, the Sonic-based story is the first comic of the issue. Sonic and Tails are in the secret underground lab of Doctor Kintobor (now Sonic's headquarters). By using Kintobor's old computer they discover that Robotnik's Death Egg satellite is falling out of the sky and that it is heading directly for the Emerald Hill Zone. Using Tails' bi-plane, they travel to Robotnik's Wing Fortress, which has been abandoned since the events of Sonic the Hedgehog 2. However, while Tails is waiting with the plane, Sonic discovers that the Fortress' defence systems are operational and on automatic: Sonic is caught in the same laser trap that Robotnik trapped him in during Sonic 2. Although he manages to deactivate the trap by destroying the laser, Tails becomes worried and follows Sonic through the Fortress, so Sonic decides to let him tag along. Sonic reveals the reason for their trip to the Wing Fortress: a space shuttle. They use the shuttle to travel to the Death Egg. Once inside, they encounter Silver Sonic, the outdated and malfunctioning robot version of Sonic that Sonic had fought last time he was on the Death Egg. This time, to ensure its destruction, Sonic kicks its head off. They make their way to the control room, but time is running out. Sonic says he will pilot the Death Egg away from the Emerald Hill Zone, but orders Tails to go to the escpae pod, despite knowing that there is only one pod left. Tails escapes, and watches in horror as the Death Egg crashes into the ocean. He briefly mourns Sonic's death until Sonic himself appears on top of the pod, having managed to get out of the Death Egg at the last minute. The two glide away into the sunset, with Sonic looking forward to the parties that are sure to be thrown in his honour when they get back to the Emerald Hill Zone. Kintobor's underground lab is revealed to be Sonic's secret headquarters. Sonic and the Freedom Fighters will continue to use this lab as their secret base until Sonic the Comic #37, "Robotnik's Revenge, Part 1", after its location is revealed by Knuckles the Echidna in Sonic the Comic #35, "Power of the Chaos Emeralds, Part 1". Tails refers to Robotnik's history when he mentions that Kintobor became Robotnik. The full history, however, will not be revealed until Sonic the Comic #8, "The Origin of Sonic". It is explicitly mentioned that the events of Sonic the Hedgehog 2 have occurred some time before this story, and that Robotnik's Wing Fortress and Death Egg have been abandoned ever since. Tails mentions the Emerald Hill Folk for the first time. An individual tale of Joe Musashi's infiltration of a Neo Zeed stronghold, in search of his kidnapped love, Naoko. Joe Musashi finds himself face-to-face with his lost love, Naoko, who had been kidnapped by the Neo Zeed ninja. The two are apparently alone, and yet Musashi is uneasy, and with good reason: suddenly, Naoko attacks and quickly incapacitates him. Removing her outer garments and a mask, the false-Naoko reveals herself to be Water, one of the Four Elements, the cruel torturers who enforce the laws of the Neo Zeed. Before Musashi can wonder where the other three are, Fire, Earth and Air drop down from the ceiling. Musashi realises that Naoko was never in the fear pavilion, and that he has been lured into a trap. Outnumbered, and still no closer to finding Naoko, Musashi uses a smoke pellet to cover his retreat. He will continue to search for Naoko, and vows to fight the Four Elements another day. Set between the first and second games of the series, the heroes Ax-Battler, Tyris Flare and Gilius Thunderhead are threatened by the potential resurrection of Dark Guld (Death Adder). Dark Guld, who has been forced to share the body of the sorceror Blackspell, intends to sacrifice Ax-Battler in order to complete his own resurrection. Ax's friends, Tyris and Gilius, follow him to Firedrake Fell. On the way, they encounter some elf thieves and steal some of their magic potions, restoring their own strength. When they reach Guld's fortress, they interrupt the ritual, rescuing Ax. Blackspell and Guld summon lava monsters to defeat them, but Tyris and Gilius combine their fire and earth magics to summon an even larger beast: a flaming bird that rises out of the volcano, collapsing the fortress around them. The three heroes escape, but Dark Guld and Blackspell are caught within and presumed dead. Now free, the three heroes intend to return the Golden Axe to the King of Yuria, where Gilius hopes to be well feasted for their troubles. The story is set after the events of Wonder Boy In Monster World. Shion enters Demon World, where two demons named Schwartz and Egger demand to see his papers. Since he doesn't have any, he resorts to defeating them with a thunder spell. Shion enters a demon tavern, The Shame Inn, to find information about the captives. The barman is initially reluctant to talk, until Shion mentions the name of Grimomen, the Demon Lord, after which he reveals that the captives will have been taken to the Pitcastle at the centre of the Demonopolis. Suddenly, however, Shion's arm - which has been transformed into a demon's arm by Grimomen and now bears his mark - starts attempting to strangle Shion, and Shion finds he is powerless to stop it!